Nobody Beats Army 15 Times In A Row! That’s right. Nobody beats Army 15 times in a row. Army broke it’s fourteen year losing streak to Navy yesterday (dating back to 2002 and stretching through last year) in magnificent fashion, and for the most part, the fashion show that constituted the uniforms was very solid too. This may have been the best looking game in years (at least in my opinion), especially given some of the ridiculous costumes both sides have trotted out over the past several years. Army was clad in a dark gray, which actually appeared lighter than in “press” photos, and it was a fine looking uniform (except for one pretty glaring exception, which we’ll get to shortly). Navy countered with athletic gold (which some of you call yellow — but never call a Navy man yellow) hats and britches, and white shirts. If you’re curious as to all the symbolism in these uniforms, I simply refer you to yesterday’s lede. If you haven’t had a chance to read that, you might want to give it a quick once-over before proceeding. Now then, let’s look at some shots from yesterday (you can click on the photos below to enlarge slightly). Nice right? But that last photo above leads me to my one (and only) real complaint, which I knew would likely be a problem going in: Army’s number fonts. I appreciate what the team was going for with their look, but it just didn’t look good on a number of players. If a player was lucky enough to have a single digit, or a number like “17” or “11”, then they looked ok. Both teams added the usual unit patches, and Army went with “ARMY” in a military font on the back of their uniform, and again using the ‘nameplate’ on the front of the uniform for a player ID. My pop was an Army man, so in my heart I’ve always rooted for them. He *just* missed WWII (he was 17 in 1945), went ROTC in college and was commissioned in time for Korea. He actually served over there, but he never saw any action (fortunately). His brother, my Uncle, was a Navy man — so I can imagine their rooting tendencies if they ever went to (or watched on tv) a game together. 14 years is a long time to go without a win. But Army finally pulled one out (the first one since my pop passed away). So, for the first time since then, I can say “GO ARMY BEAT NAVY” with authority. Awesome…thanks Ethan! Below is the graphic, which you can click to enlarge! Yesterday morning the Philadelphia Flyers unveiled their Stadium Series unis, which they will wear in their outdoor matchup at Heinz Field on Saturday, February 25, 2017. They will also wear these again at home against the Penguins on Wednesday, March 25. As you can see…they’re black (a color the Flyers have previously worn). They’re fairly straightforward in design: black jerseys with orange stripes on the arms and hem. Their breezers and socks are also black, with a repeated orange stripe on the sock. Like their current uniforms, the NOB will be a contrasting color plate (orange with black letters). The TV numbers on the sleeve will be oversized (as are almost all Stadium Series/Winter Classic/outdoor games), but unfortunately, the uniform numbers on the back will be black with white outlines, which on a black sweater may be difficult to see in a game that needs to have clearly visible numbers from the cheap(er) seats. Those black outlined numbers will look fine on the sleeve, where they’re against the orange stripe. On a black background? Might be tough to read from a distance. There are also two patches: the obligatory Stadium Series patch on the right shoulder, and a patch honoring Ed Snider, the Flyers founder who recently passed away on the left. The classic Flyers “Flying P” logo will be the jersey crest, and Captain/Assistant patches will be in black, outlined in white, consistent with the pattern on the numbers. The new jersey stands as a contemporary homage to the unique characteristics of 50 years of the Flyers uniform ”“ a bold design for a passionate city. The primary color of the uniform is black, fiercely showcasing the traditional winged-P on the chest. The single dominant orange bands are a reinterpretation of the singular bands of color on the team’s current home and away uniforms. In addition, these bands of color are complemented by a contrast color name-plate, which is a signature design feature of the Flyers’ NHL uniform. The full uniform carries the theme of orange accents over solid black ”“ black socks showcase a single orange stripe across black, gloves include orange highlights, and the black helmet includes numbers mirroring those on the jersey. I actually like these (despite the immediate criticism I saw once these were released), although I’m not sure the black outlined numbers will work particularly well in a game to be played outdoors, where seats will be much further from the ice. Guess we’ll need to wait for game day for that. Also, since the Penguins will be wearing gold jerseys for this game, it will be color vs. color. One may question the wisdom of wearing a black uniform (thus making the game in Heinz Field a black vs gold affair — the colors of Pittsburgh), but the Flyers do historically have a black uniform. At the very least, it should be a good looking game. 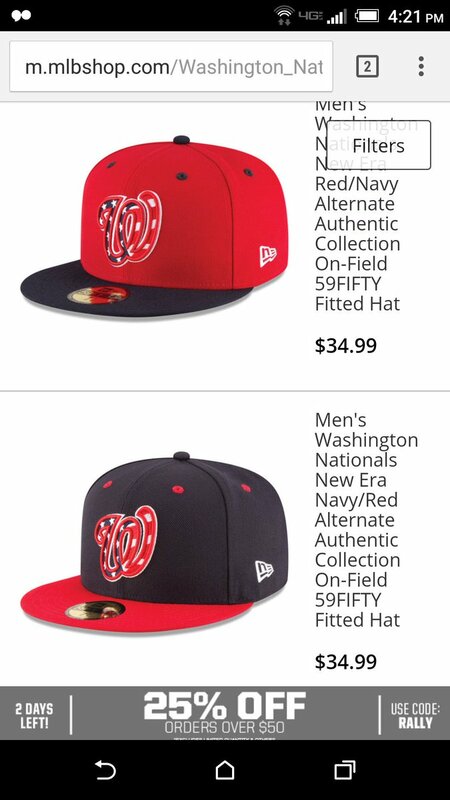 There is also apparently a second new cap the Nats will sport this year, but it wasn’t revealed at the Fanfest. However, it’s probably the lower cap here. You can see a few more shots of the new jersey here. Not bad, if completely unnecessary. 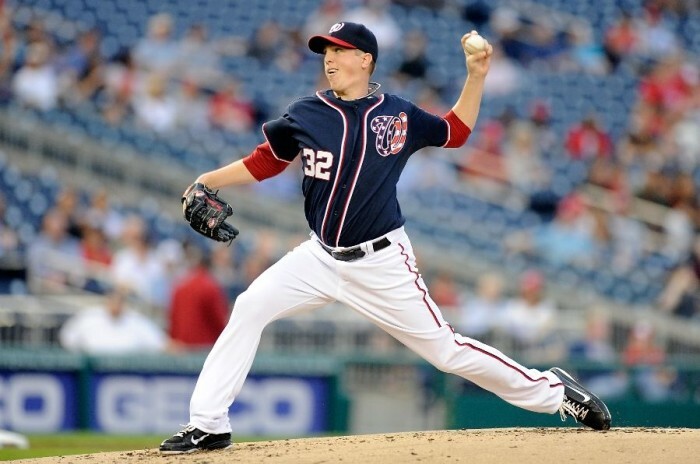 The Nats will wear the white “Patriotic” jersey for day games and the blue one for night games. More ‘murica! A very cool story of which I’d not been aware was recently brought to my attention. The story of the 1960 Berlin Braves. Who were the Berlin Braves? On July 2nd 1945, the Tempelhof-Berlin Central Airport was given over to the United States Army 2nd Armored Division. Though the United States Air Force base in Tempelhof may have never had an airplane assigned to it, it became rich with American culture and quickly gave rise to intramural sports programs. This cornerstone project kicked off in 1954 and lead to varsity teams on the Air Force base participating in many sports to include marathon running, baseball, basketball, soccer, volleyball, and softball. Many of them playing competitively and representing the Air Force under the name Berlin Braves. In 1960 a group of little league baseball players ages 11 and 12 were selected to the All-Star team to represent the Braves outside of their home base. This 1960 All-Star team traveled by train to multiple other countries throughout Europe with only their coaches and the camaraderie of their teammates (no parents) to compete in the European Championship. After winning and being crowned European Champions they traveled to Williamsport, PA to compete in the Little League World Series. In 2012 Joey Elgersma founded a new Berlin Braves project to keep the same spirit alive and offer the local youth in Berlin the same opportunities to enjoy recreational sports and overall fitness. Here are some recollections of the players on that team (and additional pics). Even cooler is a few members of that team were brought to Fenway Park to honor their achievements. To commemorate the original Berlin Braves, they teamed up with brand ’47 to help bring the spirit of the 1960 team to life with updated All Stars jerseys, caps and pennants (seen below). I love these. Baseball News: Yesterday, in 1969, “the Phillies unleashed their ‘modern’ look, which included these outfits that seem to come from a dystopian sci-fi future,” (from the always awesome Todd Radom). … CROSSOVER ALERT! Last evening the San Jose Sharks wore orange San Francisco Giants-esque sweaters for their pre-game warmup (thanks, Brinke). Also posted in Hockey News. NFL News: You know all those post-game jersey swaps Paul is always reporting on MMUW? Well, if you didn’t already know it, the players pay for those jerseys out of pocket. This report on Antonio Brown notes, “Brown buys a stack of them before the season with the expectation that he’ll give many away. As one of the league’s most marketable stars, Brown said he gets asked by opposing players for his uniform top fairly often, but not every game.” … Browns WR Terrelle Pryor will wear cleats Sunday honoring his grandma, father, & ESPN’s Stuart Scott. .. Tweeter Paul Durkee “came across this gem (yester)day, pre existence days, the Jaguars should have kept this logo.” Alas, a certain car maker had put the kibosh on that. … That reminds us of what could have been (Paul again). … The market for gear based on that logo certainly existed (from Whisky4Trubisky). Imagine if (in the ‘butterfly flaps its wings’ kinda way) that logo was used — would the whole tragic trajectory of the Jaguars uniforms have been altered for the good? … The Washington Valor, an Arena League team, have released their new uniforms. College/High School Football News: We’re not the *only* ones who track unis — this article on the South Carolina Gamecocks takes a look back at their season of uni comobs. Interesting to note they only repeated one combo, and they went 2-0 in it. … Yesterday, the Army prepared a locker and jersey for President-elect Trump. … Poor Army was really being reminded of their 14 game losing streak on Game Day prior to yesterday’s game. … Oh my — check out this Vanderbilt media guide from 1983 (pic via Sports Paper). … From James King: Cincy photoshopping the UA and Bearcat logo on to Coach Fickell. … Looks like this might be a copy of the Rose Bowl Program (h/t Thom Pucks). … OOPS! “As you can see on the chin strap, this Chevy ‘go navy’ ad on ESPN features an army helmet” (nice spot by Scare Pigs). … A Texas High School playoff game was color vs. color (from Chris Mycoskie). Hockey News: Following up on yesterday’s announcement of the Flyers’ Stadium Series uniforms, J. Walker notes the Flyers now have 3 sets of black mitts. White logo standard, gold on 50th, and orange text on the stadiums. … The Williams College Ephs have an interesting “NOB” — The logo on the new men’s ice hockey jerseys dates back to the 1920s; hockey at Williams began in 1903 (h/t Paul Friedmann). … Tweeter Tony Tengwall spotted this tweet of “Dallas Stars Keith Ballard and notes, “so many things wrong here.” … Nice throwback uniforms for the Iowa State Cyclones (h/t Connor Ferguson). … Speaking of Cyclones, the Cincinnati Cyclones busted out Rogue One Star Wars uniforms last evening (from Jeff Tasca). … CROSSOVER ALERT! Last evening the San Jose Sharks wore orange San Francisco Giants-esque sweaters for their pre-game warmup (thanks, Brinke). Also posted in Baseball News. NBA News: Sneakerheads will be crowding shopping centers hoping to snag a pair of the Air Jordan 11 “Space Jam” colorway, whose release is widely considered the biggest of the year, but Jordan Reed won’t have to worry. He’s already an “ambassador” (ugh) for the Jordan brand (from TommytheCPA). … Maybe they’re lucky? The Cleveland Cavaliers wore their orange throwback (hardwood classic) unis for a second night in a row yesterday (from Robert Hayes). College Hoops News: Color on color can work well in blue vs. red — provided it’s powder blue, and the Wisconsin vs. Marquette tilt yesterday proved nicely (h/t Ryan Wozniak). … Pretty interesting detailed court featuring the frogskin design of the TCU Horned Frogs (from Jorge Cruz). … Nice uniforms for the University of Missouri-Kansas City (UMKC) Men’s Basketball (from UMKC Basketball). And that’s it for today. Whew — lots of uni stuff yesterday! Saw my first snowflakes yesterday, which definitely means winter’s a-comin’, and they’re predicting a snow/sleet/rain mashup for the evening’s curling session. After going 3-0 to start the season, Paul, Omoy, Doug and I have suffered one close loss and one beatdown, so we’re looking to get back in the saddle tonight. Wish us luck. 23 comments to Nobody Beats Army 15 Times In A Row! I like the orange and blue hardwood classic of the Cleveland Cavaliers. 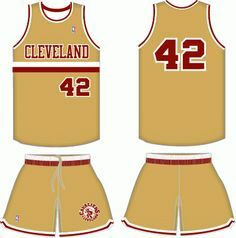 That was the uniform the Cavs were wearing at the time I started following the NBA. 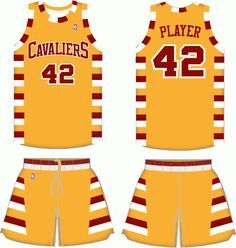 I understand that the Cavaliers switched from the wine and gold to orange and blue in 1983. There is usually some type of explanation given when a team changes colours. I am really curious and need some help from Cavs fans. I have never come across an explanation for the colour change from wine and gold to orange and blue. Was there ever an explanation for the colour change in 1983? After the fiasco that was the Ted Stepien era. the new owners, George and Gordon Gund, wanted to totally remake the Cavaliers. Hence the new color scheme. If I recall, they were even considering just calling them the Cavs. Phil, your “‘murica” contains an apostrophe catastrophe. I wore #17 in football, which would have been one of about 4 numbers that look good in Army’s font yesterday. Great idea, but the execution did not pan out. Yeah, I think those numbers would have been great as a sleeve patch or helmet decal, but not as the main body numbers. If the numbers were orange and had the keystone patch, I’d approve. Keystone patch is my favorite. The keystone- aka “The Bloody Bucket”- signified a whole different division, the 28th Infantry. That division has one hell of a history, though, from Chateau-Thierry in WWI to, and beyond, the Hurtgen Forest in WWII. The original Jags logo was great, but putting it on a silver helmet was kinda bad. No team should need to have that many colors. As we all know, this was an original logo that wasn’t original. A totally brazen lazy arse ripoff duly reported in der tickah. Lack of vision combined with greed by ownerswine jackanapes. It is a cruel perversion of the creative forces in the Uni-verse. Sadly this type of “make it look like… insert existing / or tweaking / or because I like a logo” is a very common practice in the corporate identity game and one of the main reasons I left that industry years ago. CONTEXT – I am talking about the corporate brand game here, not the “Hey I made a retro-licious tequila sunrise parody shirt for the Beer league” because I think I am clever and sober. Now guess what? I will use the logo as my corporate brand for “BeerBelly Plumbers”. (actually that is a pretty good idea – uh never mind). Trying to explain to a CLIENT why they can’t use the Milwaukee Brewers ball in glove logo is a typical example. A CLIENT once told me to “Just change the colors and we’re safe”. Actually NO Judge Judy, you are committing a crime! Is that how you want your company to be known by Wells Fargo? There are parody jerseys and tribute looks which are just freakin’ great, we all get the joke because good satire is the icing on the cake of humor. One of my favorite pastimes is to make a delicious mockery of supposedly original designs. Looks great on the field and a good laugh is had by all. Just don’t make a big branding deal out of it okay? When you try to profit from tweaking a logo and claiming it as your own creation you are crossing the street to crazy town. Happiest of Holidays to all in the Universe. Sure, it was an obvious ripoff… but it’s still better than what they ended up with. Slap it on a white helmet and let the car company own the naming rights for their stadium…. I think we’d have been better off. Actually, Larry — I LOL’ed at several of your rapier bits of commentary — au contraire, mon frere, keep this sort of biting wit coming. The link shows Jordan Reed in Jordan IX cleats in Skins colors, not the Space Jam XI. Phil, your dad and mine were nearly the same age. My dad was 18 in ’45 and in the 7th Infantry, literally on a troop ship for the invasion of Japan when they dropped the bomb. He was sent to Korea as part of the postwar occupation, but he was out of there before hostilities started. So he dodged two bullets. As much as I dislike the curly W, that Nats cap is tempting me to lift my New Era moratorium. Every time I think I’m out, they keep pulling me back in! Very cool seeing the original version of the Jaguars helmet. Although black and gold on a silver helmet looks odd. The Flyers’ unis are pretty disappointing. They’d be better if, again, they didn’t try to do the black-on-black with the numerals. Also, I’ve long tired of the contrasting nameplate. It stopped being cute long ago, and needs to go die in a fire alongside “vintage white”. From close range, I think they made all the right decisions on the design. Black with white trim is carried from the logo through all the numbers and the captain patches. It all coordinates very well, as does the orange nameplate with the stripes on the jersey. From viewing distance, it might be a different story, but we’ll see. At least the outline is heavy enough to give it a fighting chance. As for the contrasting nameplate, I think it has a clumsy look to it, but I’m glad it exists. I enjoy team-specific quirks. I like the new additions to the Nationals uninform set. Very appropriate for a team with that name and one that plays in our nation’s capital complete with presidents running around the place. Attended a game there this summer, and it was fun. Flyers fan here – hated black as a primary sweater color for their standard home/away when it recieved that designation in the early 2000’s. However, as an alternate (or one-off), I don’t mind this.